Without trying to sound too much like a touring rock band, we’re flat out going from show to show at the moment. Arab Health finished barely two weeks ago with the visiting UK contingent reporting an excellent event and much business being done. Next week sees the Middle East food & drink industry’s week in the spotlight, with Gulfood in Dubai, and we’re again looking forward to working with the Northern Powerhouse and the 45 companies they’re bringing on their annual UAE mission. We also undertook our own tour recently: Tamreez, our Head of Consumer & Retail, visited Saudi Arabia on a DIT organised retail mission and writes about her eye opening experiences and first take on the seismic changes happening there. Whether it’s healthcare, food & drink, retail or construction, we’re interested to hear how we can help your plans in the region. 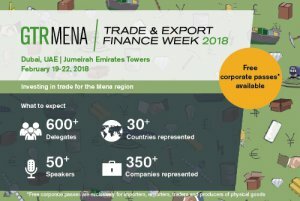 In addition, this month we’re also pleased to be supporting the GTR MENA Trade & Export Finance Week 2018. The UAE’s construction industry looks set to maintain its leading position within the GCC as the country continues to prepare for Expo 2020 Dubai. Read. In my role as a trade and investment consultant, I sometimes deal with first-time business travelers to the UAE, especially women, who ask me questions about the culture and dress code. Read. The event is taking place on 18th February and as a media partner, we have 15 free passes and you have a 15% discount. Click here.